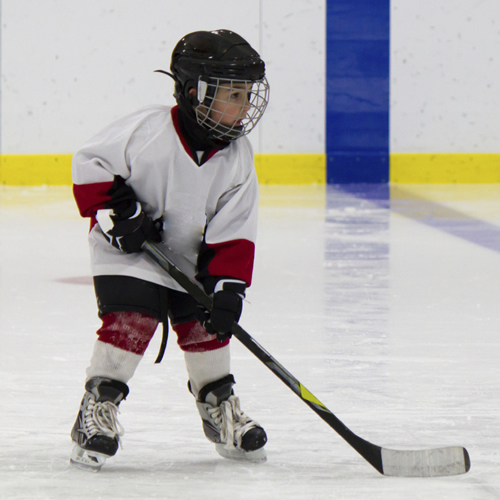 Our Hockey Fundamentals program is for girls and boys ages 5 – 9 years old. Our hockey school helps to develop a hockey player´s skills including passing the puck, stick handling, shooting and a small amount of scrimmage as well. All participants must have fairly well developed skating skills. Our Hockey Fundamentals program is not a Learn To Skate program or a substitute for good skating skills before they attend this program. For advanced hockey programs including hockey leagues, On-Ice and Off-Ice hockey skills developemnt in Guelph, Waterloo, Kitchener, Ayr, Breslau and the surrounding Waterloo Region please see The Hockey Loft. We also have goalie development and fundamentals for hockey as well Goalie Fundamentals. Ice-Tech's hockey School is a combination of skating skills, puck handling, shooting skills, passing skills and some scrimmages in order to help the beginner and the developing hockey player improve their skills in all areas of hockey. Our coach ratio for this program is usually a 6 to 1 ratio. Of course, because we focus on skating we always take the time to practice skating basics such as stops and starts, crossovers and of course backwards skating. We’ve Got Power Skating Too! Ice-Tech has combined its Power Skating programs with The Hockey Loft. Please refer to The Hockey Loft’s website for On-Ice Power Skating sessions.